My Cleveland Triathlon Club had a training session to help prepare us for a Duathlon race on April 9th. 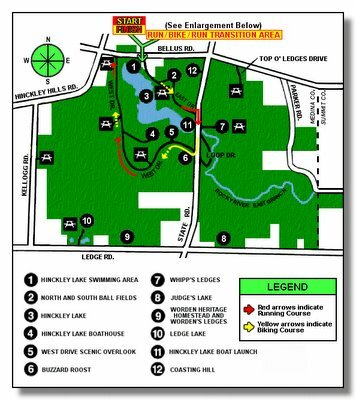 The course is a hilly 3 mile loop around Hinkley lake. The training schedule called for us to bike 5 loops then run 1 loop. I got there a little early to squeeze in a run before the club members came. There may have been 10 to 12 club members that came out on this beautiful sunny 25 degree morning. Most of them showed up with their mountain bikes due to the cold weather. We started out at a nice and easy pace. I realized the last time I was out riding was back in November and my riding confidence seemed to have waned. After about one half mile riding I noticed my front wheel wobbled like the front wheel on my car did when the wheel alignment went out. It must have been the road because it never happened for the remainder of the ride. I can't wait to get my bike out more because spinning on the trainer is not the same as riding out on the road. We will have another training session next week Saturday. Hi, if the front wheel wobbles a bit, be sure to check if it is sitting on the fork properly. My rear wheel was once not seated properly and held by the clamps, which lead to wobbling on downslopes. Dangerous position to be in. Just release the front wheel, make sure it is seated securely in the fork before you tighten it up again. God Speed! But seriously glad it wasn't anything big. Oh gawd, that would just have me worried like crazy if my wheel wobbled like that. nice riding there!